It’s another Not-Winter day with a high in the 50’s, no ice on the lakes, no snow on the ground. Perhaps this lack of ice resembles the end of the last Ice Age, a time when climate change gave to our planet and took things away. When the last Ice Age was at glacial maximum 18,000 years ago, so much water was sequestered in ice that sea level was 390 feet lower than it is today. When the climate warmed the ice pulled back enough for people and animals to migrate to previously inaccessible lands. Some crossed the Bering land bridge to inhabit North America 13,000 years ago. Climate change provided them with a new place to live. Back then England was connected to Europe on dry land that stretched from the Netherlands to East Anglia. The melting glaciers deposited a moraine between them that became the highest ground, Dogger Bank, outlined in red above. 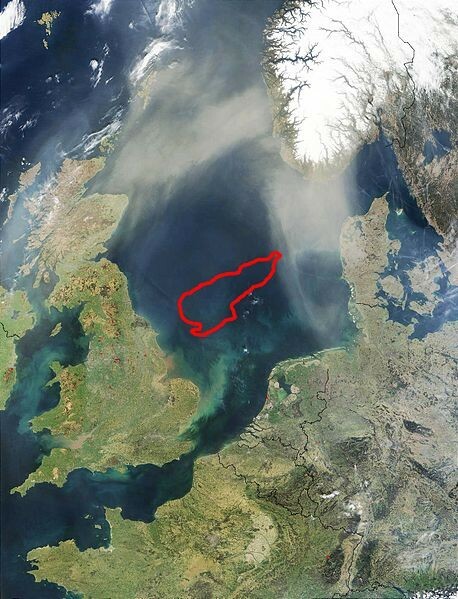 In its heyday Dogger Bank (sometimes called Doggerland) was probably 100 feet above sea level, home to mammoths, saber-toothed tigers, deer and the Stone Age people who hunted them. The end of the Ice Age took all that away. The glaciers kept melting, sea level rose, Dogger Bank became an island and was finally swallowed by the sea 8,200 years ago. The sea kept rising until Dogger Bank is now 49 to 118 feet underwater. Modern humans didn’t know it was inhabited until fisherman trawled it and found Stone Age tools. In our own time climate change is giving and taking away as well. Glacier melt gives us newly accessible land but the ocean will eventually engulf today’s low-lying islands, a frightening prospect to those who live there. The Maldive islands, with a population the size of the City of Pittsburgh, are going through political unrest (in 2012) as they face the prospect of homelessness in this age of rising seas. If these nice, mild winters are what we have to look forward to, then I say bring on the global warming.